This past weekend I received a free Roland XP-80 workstation that powered up just fine but with no sound. The reason was that under the keys, a gooey substance was oozing from under the keys which had them stuck together. After careful review, I found that it was an epoxy of sorts that was breaking down and under hot humid temperatures would change to a red or pink gooey substance. Many of the weights for the keys had already fallen down and some of the epoxy was seeping into the other areas of the keyboard. Fortunately, the Roland XP-80 did power up and for the most part, the epoxy was confined only to the key areas. Thus I feel a successful repair of the key bed on the Roland XP-80 is possible. Another lucky find, (from a used sales shop I frequent in Japan), was that the sales clerk neglected to check for expansion boards. So in addition to a free Roland XP-80, I also received for free an SR-JV80-10 Bass & Drums board, SR-JV80-11 Techno board, and an SR-JV80-03 Piano expansion board. Amazing! Update #1: So far I have removed all of the black and white keys. I cleaned them with a special cleaner in Japan which I can’t decipher the name of. Cleaning the keys was tedious but ultimately the cleaner worked. I found that my black keys all had weights, however, I am missing eight weights for the white keys. I read that someone was able to use 10g fishing weights as a replacement. I weighed the metal piece under the key and indeed the weights are 10g. ( without key attached ). Putting the keys back together should be the easy part. Currently I am cleaning the metal chassis and should hopefully have the Roland XP-80 ready for testing by Thanksgiving. I probably could have called Roland in Japan and asked about a replacement key bed, but I originally thought someone had spilled liquor or some sort of candy substance on the keys. So I had already started to take apart the keys before I realized it was the notorious red epoxy problem. I still may have to in the near future remove the keys again and try to remove the weights on keys that still have the red epoxy in them, but for now I am aiming to test the overall operation of the Roland XP-80. We’re heading into the Winter, so perhaps this spring I’ll have time to properly remove the leftover affected weights. The sales clerk understandably had no idea about the problem. As long as the Roland XP-80 had power I felt I could at least connect via midi so I accepted the big bundle of epoxy mess. The Roland XP-80 is now looking very clean and in excellent condition, so I’m feeling pretty good now about getting the keyboard back on it’s feet. I’ll update this article shortly as I progress. Note that to the best of my knowledge, the red epoxy problem also applies to the Roland D-70 and JD-800 keyboards. I’m not sure if any others are but if I find additional info, I’ll update my post. Anyone else out there have any experience with red epoxy oozing from their Roland keyboard? Update #2: I have now fully restored the Roland XP-80. It works beautifully now with no issues at all. While restoring the XP-80 I noticed the following things that may help others. 1. When replacing the keys, I found I had to also replace the green felt to prevent keys from sticking. This was easy to do. 2. After removing the plastic strips to remove the black and white keys, I used double sided sticky tape to place the plastic back into place. 3. I used 10g fishing weights to replace missing key weights. 4. DeoxIT was used to clean the contacts of the expansion boards and sockets. After cleaning I got no sample output distortion. Previously some of the expansion boards were not detected, but all that was cleared up by vigorously cleaning the contacts. 5. I also had to “generously” clean the carbon key contacts both on the PCB board and the Silicon strips in order to revive dead or weak sounding keys. This took a few times but ultimately all keys were brought back to life and the XP-80 sounds great. 6. I also bought a few tubes of cement to shut close the weights inside the keys to ensure they both don’t fall out or that any remaining epoxy doesn’t leak out. The Roland XP-80 sliders, knobs, jog wheel, LCD Display, and Floppy Disk drive all work excellent. 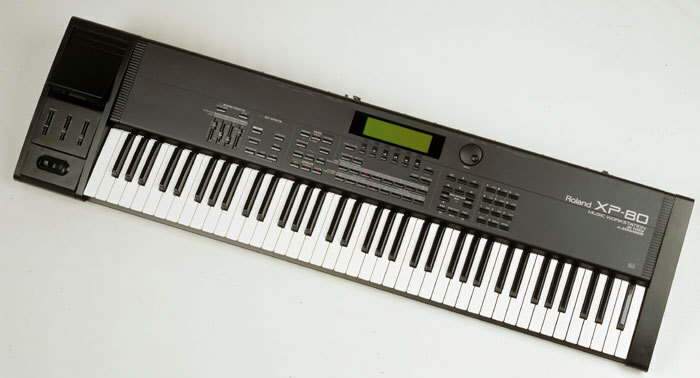 The Roland XP-80 is a fun keyboard and I’m glad I could get it back into playing shape. Hope this info helps others with the epoxy or other problem. UPDATE: I have the Roland XP-80 up and running in perfect working order now. Here is a clip I recorded using the Jazzy Rhodes in the 60’s and 70’s keys expansion board. Thanks for that post, it was good to see it’s not just my xp80 with the problem. Can you tell me what you used to clean the epoxy off and replace the weights with? I’m living in Japan so my wife had this special cleaning solution called “Magic Cleaner” that she purchased from the hardware store. I’ll have to check and see what’s actually in it, but what we did was soak the keys in it and the epoxy substance dissolved over a period of about an hour or two. We then sprayed the “Magic Cleaner” on bad areas of the metal chassis and bottom metal cover which also worked to dissolve the epoxy. In my case almost all of the metal weights had fallen off the keys and stuck to the bottom metal cover. Only a handful were left in the keys. The “Magic Cleaner” helped me to get the remaining weights out after soaking the keys over night. I think compared to some other Roland XP-80 owners, my process of cleaning the keys was slow. I think it took 2-3 days to completely remove all the red epoxy, however time will vary depending on how much actually drips onto your synth. I had 8 weights missing when the sales clerk gave me the Roland XP-80. I had read on the internet somewhere that somebody used 10 gram fishing weights to replace the old weights with. I weighed one of the original weights and sure enough it was exactly 10 grams. I then went to a local fishing store in Nagano-city, Japan and had the sales staff show me so fishing weights that were 10 grams. Surprisingly they showed me quite a few. I picked the ones that I felt were flat and small enough to glue onto the keys. I then took a hammer at home and pounded them a little bit more to make them flatter. It worked like a charm. The fishing weights work great because they are small and have actual weight values on them. Otherwise you’ll need to bring a small scale. You could also likely use some sort of bracket or metal hinge for weights too. I then found some new epoxy that would glue metal and plastic together. Again with my wife’s help I found some epoxy at the local Japanese hardware store and so far it is working great for gluing the weights back into the keys. I’ve been playing the Roland XP-80 now since writing this article and so far have not experienced any weights falling out so I’d say any decent epoxy used for metal and plastic should work for you. Finally I should mention that it’s worth changing both the green and white “felt” if you get a chance on the metal chassis. It really makes a difference with making your keys more quiet and more smooth to play with. I just replaced my felt strips with felt material from the fabric store and the key action is much much better now. A lot of people complain about the key action the Roland XP-80 has I’ve read and replacing the felt strips really worked well for me in bringing up the quality level. It’s now a very nice keyboard. In fact, it’s fantastic!! Hi Jim,how did you dettached the white felt which sits on the sensitivity sensor?and how did you replaced it? 42 insert effects: reverb, chorus, delay, ring modulation, distortion, etc. The first number on the display (1.04 in the above example) is the ROM version. The second version number preceded by CPU is the CPU version. Press [EXIT] to leave this screen. ROM 1.10, CPU 1.04 are the latest versions reported. CPU 1.02 fixes a problem with the PR-C:098 patch. Sometimes when played ‘popping’ and ‘clicking’ can be heard. This bug appears to be very specific and only occurs on patches with similar structures and parameters to PR-C:098. ROM 1.10 fixes a bug when assigning GM patches 041-056 to Performance PR-A:01 Part 1 no sound is heard. When loading and converting a SMF format 1, track 15 may be merged into track 16 and track 15 will be empty. In track info screen, track 16 _may_ show the information for a previously loaded song. When using soft thru and there are multiple note on messages, the XP _may_ only transmit one note off message. While recording the timing may have occasionally drifted. ROM 1.08 fixes a bug when recording with the Quantitize function ON, very rarely the XP may miss recording. ROM 1.07 fixes a slave mistep bug, an external sync to clock bug and a chain play bug. ROM 1.05 correctes a timing problem with the sequencer syncing to patches (drum loops) from the Dance exp. board. ROM 1.04 apparently fixed some sequencer timing problems when large amounts of MIDI data was being received. are you sure that latest version CPU is 1.04 ? Hello Jim, where were you able to find DeoxIT in Japan (have you found Fader Lube too by any chance)? I’ve looked around locally but cannot seem to find either one of these anywhere. Hello! I find Deoxit either on Amazon Japan or at most Hard Off stores. Today in fact I bought a small can of Deoxit for my Roland MKS-20. It’s a bit expensive but it works very well which is why I reluctantly fork over the dough. If it gets my synth fixed, I’m sold! hi jim,i’ll be visiting tokyo end of this mth.stayin in shinjuku-ku (Hyatt).are there any 2nd hand music stores nearby? i am also trying to source for the LCD display for my XP80 (2 units) .any leads? tnx a mil!! Hey everyone! Just wanted to share my experience for the red epoxy glue drip issue. I have the Roland JV-1000. I used Rubbing Alcohol. Basically I applied a little of the alcohol in each black key where the weights are mounted, let it sit for 10mins and then with a precision knife scraped out all the glue and pulled the weights out with a needle nose pliers. Then I cleaned the keys, applied a small amount of glue on each side of the weights and glued every weight in. For the white keys, same thing…. but was not able to remove the weights since they are the flat type. Instead I just soaked the weight area with alcohol and scraped all the surrounding glue. This still maintained the flat weights. I then took clear silicone and applied around the flat weight. Finally, I cleaned all the keys with soap and water, air dry and rebuild the key bed. The whole process was tedious but really not that bad. There were some glue residual on some rubber key contacts and the Contact Boards. Believe it or not, I cleaned the boards with the same rubbing alcohol. Fortunately for the Rubber Contacts I had one little glue spot which I was able to remove. I also carefully cleaned the carbon contacts on the Rubber Contacts with a damp alcohol but not touching the rubber part. As for the green felt strip on the key bed I did exactly what Jim mentioned by scraping out the glue. Thanks Jim!! I used Detox as mentioned for the Contacts but did not work for me. Instead cleaning with the Rubbing Alcohol did a better job. Every key including velocity works Great!! Thanks for all the tips on this Forum. Hey guys! I´ve Just assembled the keybed but noticed that some keys are not working, i think its the rubber contacts or the carbon contacts on the board…what do you think i can use to clean the contact on the board? and the rubber contacts may i clean those too? Some help would be appreciated. Thkx to Jim for all his help! I am in process of removing keys from my Roland xp80 because of the epoxy issue and just wonder if you can elaborate on HOW to get keys out. I have removed the bottom, the board over the keys and the stripe that holds keys in but can’t seem to get them out for fear of breaking them. Any help would be appreciated! Hi there! It’s a bit tricky to maybe explain in written form, but if I you basically have to grab the tip of the key and push inward back towards the end of the metal frame. Then you can lift the key off the chasis. As you already mentioned, you need to make sure the plastic strip holding the keys into position is removed. You can easily replace this with either double sided sticky tape, or in some cases just putting it back on with the existing sticky leftovers in place. Note that with mine, I had an occasional epoxy drip embedded in between the keys and the metal chasis, so at times some of the keys were difficult to remove. However, I was able to exert a bit of force without breaking the keys as long as I pushed them back in “level” fashion. Hope this makes sense! Best of luck. The Epoxy problems is just nuts! I’ve had it on three Roland keyboards thus far. Thanks for the reply. I have discovered there is a spring that is attached to the key and then to the metal bracket and that’s what was keeping me from pulling keys out. Very hard to get back in!! I am so thankful that you posted this! I was ready to throw out my Roland XP 80! Now I’m wondering if it’s fixable! This happened to me as well and as a musician/songwriter I’m extremely feeling the withdrawal from my Keyboard. My keyboard still turns on okay and some of the keys still make sound. However, I am concerned that the majority of the keys fail to make a tone. Did yours do this as well? I’m wondering and hoping it would be worth my time to try and “heal” the Roland. If it does not work I will need to purchase something new as I am constantly hired for gigs. I’ve rented quite a few for the time being in hopes that the XP 80 could be repaired. One question for you. I have never taken apart a keyboard and am a little hesitant (though concerning the circumstance I’m not really afraid since it’s useless at the moment). Do you mind please telling me how you took the keys off? If you have any pictures that would be amazing as well! But I’ll take what I can get! So glad to have found this site. My girlfriend owns the XP-80 and has loved it but the LCD screen is dead. Does anyone have a source for a replacement LCD and can you tell me if it is difficult to replace or not? Thank you for any info you can share. I dissassamble the back black metal case and I reached inside of keyboard. Next, I dissassamble the keyboard. I saw the red epoxies all over the keys. Some of the keys are stucked. 1) When I pressed power on, lcd and power works normally. But no sound includes mix 1-2, headphones, direct outs 1-2, click outs. I tried the rhytm mode and I see the keys working, screen writes which key i pressed well. 2)I think keyboard part is not a part of audio boards parts. I mean, if the no sound problem is about red epoxies, when I remove the keyboard sockets goes to boards then problem will end and sequencer play the songs..But nothing happened. 3.I’ve tried the sequencer record. Seq record all of the keys with true velocities. I see it in screen micro edit mode. So the keyboard keys are working still the red epoxyes. 4.I didn’t clean the epoxies becaus few keys was stucked. I just only fixed the stuck keys. And I did clean the first board of keyboard contacts. (1. board of silicon-carbon contacts). Nothing changed. 5. If headphone plugged in the headphone or clickout and when I pressed power on button, I heard a little click sound from headhone. But no sound other outs. Also I tried the local switch on-off and utility/factory settings too. Nothing worked. I think my audio out chips,board or module was gone. What do you think? Hello Basar! Thanks for visiting my blog and the comments. One thing I’m curious about is whether you tried using a midi controller to check the XP-80 for sound. When I first bought mine with the red epoxy, I used a midi connection with controller to verify the sound. The only way I know for sure that you have an audio board problem is if you check via midi. At least that’s the easiest way to start. The red epoxy in my experience does not eat any of the copper tracing like battery acid would. However, it can become an obstacle for triggering properly the sound module built into the XP-80. On some boards if one key is dead it can actually cause an entire block not to work. You are correct that the keybed itself is not apart of the audio board, but the midi inputs are which is why a controller is your best bet for checking the sound. It also sounds like a few of your keys might work so perhaps you were able to try this, but a midi controller would definitely verify things. I’ll check the service manual and see if I can find out any further info. I’ll update my post shortly. Thanks! 1. Press the [UTILITY] button. 2. Press the  button on the keypad. 3. Press the [ENTER] button. 4. Press the [F6] button. 5. If “Write Protect ON” appears on the display, Press the [DEC] button to turn the write protect to Off. 6. Press the [EXIT] button. 7. Press the [F6] button again to execute the reset. This actually may solve your problem. Hi Jim! I just picked up a used roland JV-1000 and it too has the red epoxy problem. Every single key is stuck. The other issue is that both LCD screens are out. Do you think this could also be caused by the red epoxy? I remember some units require a watch battery to back light these. Do you know if this keyboard uses it or are the LCDs toast? RIght now I they are completely blank. Thanks for the info! I has had a very intensive life so far and was used on stage a lot. Two black keys were stuck because the weights had dropped out of them. About 1/3 of the keys don’t work so the contactstrips and boards will need to be cleaned. I took the keybed apart and it was extremely dirty. A lot of dust and red glue. I always let the keys soak in a caustic soda solution overnight. Works great. The weights of the white keys usually fall out by them selves. Some keys need a little tap after soaking a night for the weight to fall out. The weights in the black keys usually need a little help by pulling them out with plyers. The ingredient to make caustic soda is sodium hydroxide which is de main component in drain cleaners. I use the dry grainy white stuff not the liquid one. There is only one store in the Netherlands (were I live) that I found that sells this (Kruidvat). I couldn’t find it in any hardware store.. The bottle / box should say ‘100% sodium hydroxide’ (or Natrium hydroxide in Dutch). Mix 50grams per liter of water. (don’t know why but that works fine for me :-)) Be very carefull and wear rubber gloves and eye protection! It creates an exothermic reaction (water gets hot fast) If you get this stuff on your skin wash with water immediatly because it causes burns! Oh and use a plastic container made out of PE or PP. Not sure others plastics will dissolve or not..
Keys and weights will not be affected by caustic soda is my experience. I have rebuild U-20’s, D-70’s, JV-80’s and now a XP-80 with this problem. The XP-80 is almost back together again. Hope to test it today or tomorrow. I have a jv80 with the same sticky key problem. The rom play is working fine so I assume the tone module is fine. I cleaned the keys, replaced the felts and put it back together. Now some seemly random keys don’t work or work on sometimes. There seems to be no pattern to it. Oddly all keys were working before. Could this be a dirty contact situation or might there be an electronic problem? Thanks, Mark Owen. Make sure you connected the ribboncables correctly. If it worked before you took it apart it’s probably not the contacts. Or did you leave the whole thing disassembled on top of a closet for a month? 🙂 You could clean them anyways.. not that difficult nor timeconsuming. Remove all the rubber contactstrips and carefully clean the black carbon dots inside with a cue tip dipped in some isopropanol (alcohol). I also clean the black (of gold) colored contacts on the circuitboard with a cue tip. Hey Jorick. Thanks for the reply. I’ve cleaned everything pretty well. Some keys seem a little weak. Two different black keys still don’t work at all. I agree with your assessment on the ribbon cable. I just don’t know how to make it connect correctly. Any more ideas on this. Thanks for your help. For anyone trying to fix a jv80. Try this site. http://www.unmarked place.com. It has a bunch of info on fixing the jv80. Lots of pictures. I looked at some photo’s of my disassembled XP-80 and you really can’t go wrong with connecting the ribboncables. You have 2 black keys that don’t work. If it’s a ribboncable problem there are usually 5 to 8 keys next to each other that won’t work al all. Never just one key because the design of the board uses multiplexing. Eg: there are more keys than there are leads in the ribboncables. So if it’s just 2 black keys that aren’t next to each other it’s probably not the cable. Try switching two contactstrips. Does the problem move to? If you have tried cleaning the carbon contacts and that didn’t help it could be that you need to replace the faulty contactstrip. I ordered 5 new one’s once for a Juno-D that I couldn’t get a 100% and they just cost 4,5 euro’s a piece. Jorick, thanks for the explanation. When I looked at the ribbon cable closely I thought there seemed to be more keys than connectors. The suggestion sounds like a good strategy. You seem to know a lot about this keyboard. I really appreciate the help. I really want to get this keyboard working. It has some sentimental value and I love the sounds still after 22 years. I bought it new. My JV80 has the same problem with the leaking glue. I bought a replacement JV80 off of eBay, which has not arrive yet. I want to prevent the glue problem on this one, as I suspect it will only be matter of time and temperature before goes through its metamorphosis. What can I use to seal the keys? I thought of clear fingernail polish. What did you use or what do you suggest? Thanks!! If you go through to trouble of removing all the keys I would deal with the problem in a permanent way. It’s not a hassle at all. In the comments above you can read the method I used many times. You need to dissolve the red glue with a chemical solution called Causic Soda. You get that when you mix Sodium Hydroxide with water. Sodium Hydroxide is the main component in drain cleaners. I always used 50 grams per liter but recently experimented with 100 grams per liter and that works 10 times faster. Be carefull: caustic soda is dangerous and can cause burns. – permanently fixed, have beer. Thank you for the instructional advice for the glue problem. I have taken the keys off of my old JV80 and will do the caustic soda soak and glue the weights back on the keys. BTW, what kind of glue did you use when you re-glued the keys? On my replacement JV80, I will remove the keys and put the newly glued keys on it before it succumbs to the dreaded melting epoxy disease. Hope I don’t screw anything up on my “new” JV80. I thought about taking it to a repairman to install the new keys. Most likely I’ll attempt it myself. If I mess things up, then I’ll take it in. My only concern is putting the keys on the new JV80 correctly. Anyway, thanks ever so much for your help! I use Bison Kit glue. It’s a very strong contact adhesive. It comes in a metal tube and the color is beige. Just a little pea sized drop and then whiggle the glue from front to back with the weight when installing it. I use a lot less glue in comparison to the red glue and I never had a weight fall out. Only very little Bison Kit is visible on the sides of the weight after installing. When I used 50 grams per Liter Sodium Hydroxide the weights from the black keys never dropped by them selves. When I use 100grams per liter they fall right out after a few hours of soaking. I refresh the solution once or twice. After the first soak remove all the keys where the weights have dropped and put the rest in a new solution. Taking the JV80 to a repairman probably costs more in labour than the JV80 is worth so I would repair it myself. The key order is simple. All the black keys are identical. You can see on the metal frame where the black keys need to go. The rectangular openings are a bit bigger (or smaller.. I forgot). Always put the black keys on first because they cannot be installed when the white keys are installed first. On the white keys you can see which key it is eg; CF, D, EB, G and A. C and F are identical and so are E and B. There are also numbers on the keys which confused me at first but they are just mold numbers. So CF11, CF12, CF13 etc are all identical. Thanks Jorick for all the great info. I appreciate you taking the time. I’ll most likely replace the keys myself once I do the soaking and gluing. I looked up Bison glue and of course they make different types but it looks like (based on your description) you used the type for metal. Perhaps a good epoxy will do the trick either way…we’ll see. I’ll post my progress once I get things going. Thanks again Jorick! I have a jv80 with the ole red goo problem. I have got the keys working smoothly after cleaning the red stuff off. I had a problem with some dead keys. I replaced the two inner rubber contact strips and cleaned all of the contacts on the board with an eraser. The dead keys started working but now there are other keys that are not working. I have cleaned the contacts on both the boards and the rubber strips. Every time I put the key assembly back together dead keys start working and other keys go dead. It seems random. Any ideas anyone? I’ve read that cleaning the contacts with an eraser doesn’t work very well.. try Q-tips and some cleaning alcohol. Works fine for me. If that doesn’t work try painting the contactsurfaces on the rubber strips with CaiKote 44 (See Roland U-20 rebuild on this blog) or replace the contactstrips. Hey Jim. I don’t think I can have the same Wurlitzer sounds (in your Youtube video). Are they from a SRJV card ? I had the same issue. Cleaned it all up,replaced the weights etc. I used weatherstripping for the bottom “green” felt and felt strips on the top (after touch sensor). The problem is now the keys shift from side to side, making the board miserable to play. I used Sodium Hydrate to remove the epoxy from the key frame, which destroyed the felts. XP 80..all cleaned up. The felts were destroyed due to the HNaO. Tried a home felt replacement..now the keys move side to side, and hang up. What have you guys used to replace the felts? Its hard to find a LCD screen.Ive tried looking every where unless someone has an old Xp80 and wants to sell it by parts. I was able to get a new one from an Xp80 a friend had, the board was burnt..
Found one on ebay but had to wait for months. God i’m glad i found this blog,i recently bought an xp80 for very cheap but has this dreaded glue problem,3 black keys are sticking,i disassembled it so i can have access to the keybed,i found out that there is a little epoxy that melt down on the WHITE FELT strip,i tried to scrap it but i cannot take it out tottaly,so i have 2 options in mind now and i hope someone can help me out..
1.GET RID OF THE EPOXY IN THE WHITE FELT -i have no idea how to totally take out the residue of the epoxy without damaging the white felt,i believe there is a circuit underneath the white felt which i thought only a double sided tape,turn out to be the connection for the keybed to the main board?if i put say chemical product,it might ruin the felt and the connection totally..
Good post I had the xp80 in storage. I pulled it out and notice the glue on the keys had melted. Also the display doesn’t show anything. Is there a fix for the LCD Display or does it have to be replaced. I am about to fix glue problem. I thought my LCD was broken. Turns out Jim’s factory reset was all I needed. Can’t change contrast if you can’t see the screen but after restoring to factory presets the LCD is perfect. Hey Jim, good article. Do you have any experience with the XP-50. I have owned mine since 2000 but have just noticed that the expansion boards are not being recognized? I have replaced the battery but it says it is good on the display. All else works fine but I can’ figure out why the boards should just stop working. Do you have any advice. I too have had this problem. It’s only a few keys but the weights have fallen and there are globs of epoxy under the keyboard. I didn’t realise this might spread. I’m not confident about replacing keys but need to make sure this doesn’t spread and would happily pay for a repair/clean up. I’m in the UK. Will calling Roland help do you think?